The votes are in, and the Mayor of Halloween Town looks like he just stepped out of the town square in this fully screen-accurate cloth-costumed action figure! In scale to the other coffin action figures, the Mayor has a rotating head to display both of his facial expressions. 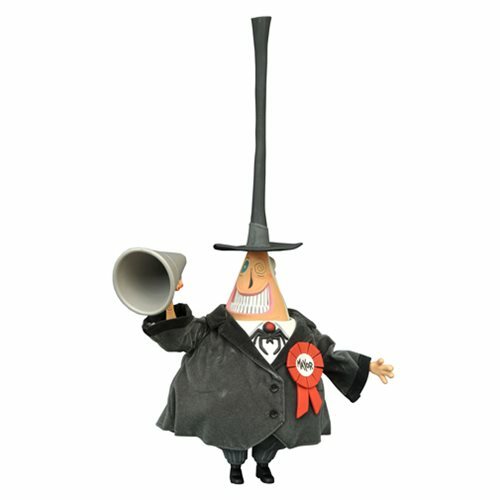 The Nightmare Before Christmas Mayor Deluxe Action Figure comes with an interchangeable megaphone-holding hand and measures approximately 6-inches tall (12-inches with his hat). The Mayor is in scale with Jack and Sally, and is limited to 1,993 pieces. Packaged in a full-color window box. Ages 8 and up.